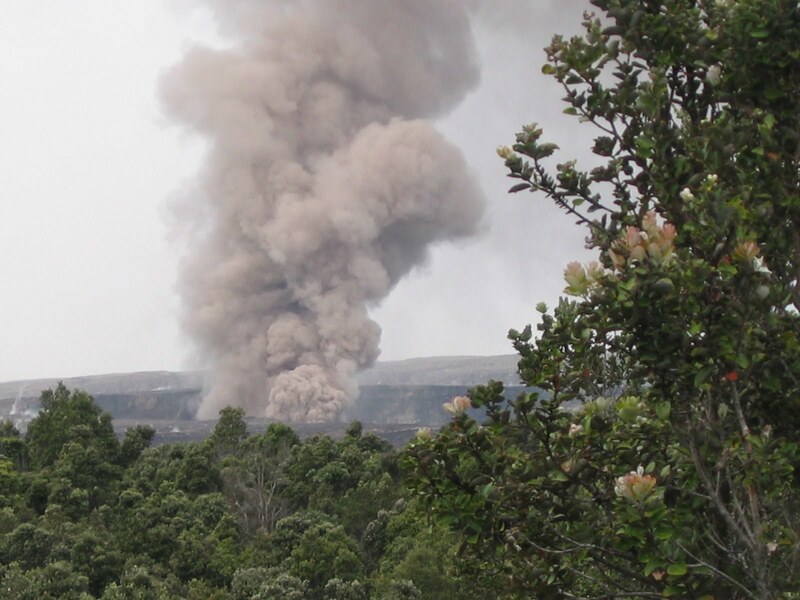 Volcanic eruption of Halemaumau creator in the Kilauea Caldera of summit occurred two years ago. At that time gases were brown clouds and built up high and straight because they contained a large amount of ashes and also had explosive power. Recently the gases are primarily Water Vapor and soon pushed to west by trade wind because of losing explosive power. They contain noxious sulfur dioxide and give bad influence to the peoples in Kona side. There is no well in Hawaii island because volcanic ash and pumice cannot keep water inside. Country side, no water supply available, people get water gathering rain from roof and keep it in a big tank. They are worried about containing noxious gases in rain. The amount of gases are decreasing and color becoming white, color of water vapor. It is gettin to the last phase though some times little explosion happened.